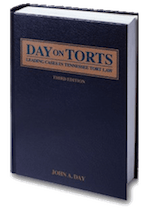 Day on Torts Book | Nashville Personal Injury Lawyers The Law Offices of John Day, P.C. "Quick! I need a case that says ..."
If you are an associate in a law firm, you've heard it. If you are a partner, you've said it. Day on Torts provides a quick, reliable resource of the leading Tennessee tort cases that will answer the questions you regularly face in your tort practice.